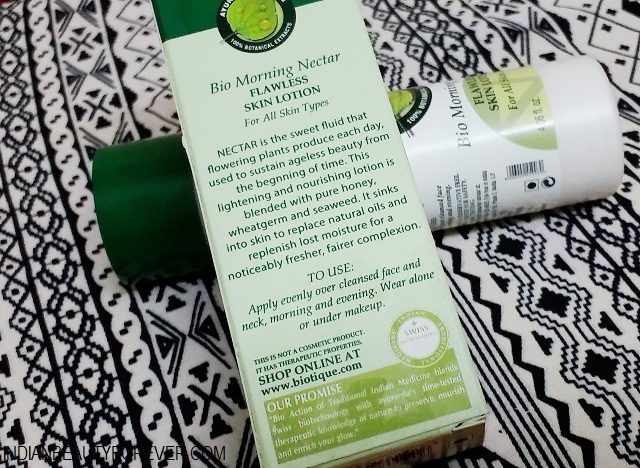 I will review Biotique Bio Morning Necter Flawless Skin Lotion today. The product actually replenishes the lost moisture of the skin and also brightens the skin. I am not using foundation on daily basis these days since that is taking a toll on my skin and guess what?? My skin which was a combination of normal to oily has become a combination of less oily and slightly dry on the cheeks which means my entire skin is getting dry even though summers are approaching so when I got this Biotique Bio Morning Necter Flawless Skin Lotion, I know I am going to use this as a day lotion. Why? Let’s get to know in detail in the review. 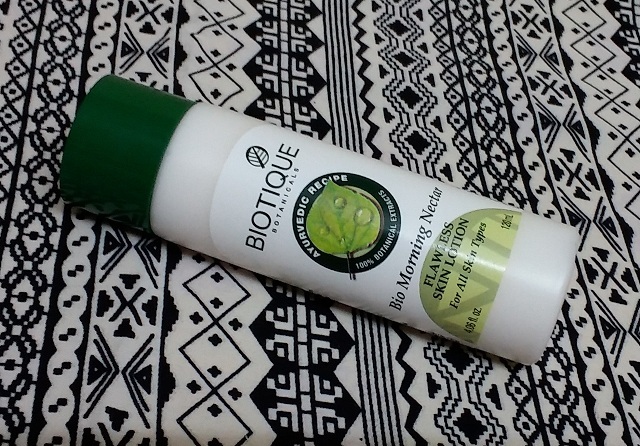 Price: Biotique Bio Morning Necter Flawless Skin Lotion is priced at 199 rupees for 120 ml bottle. 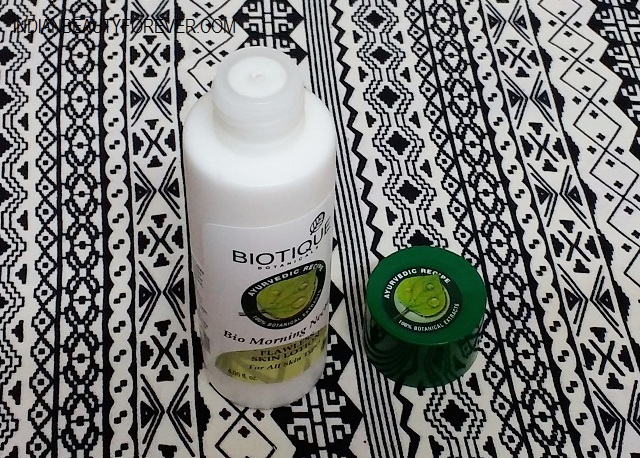 This product too has a similar looking packaging as that of the tan removal scrub from Biotique. 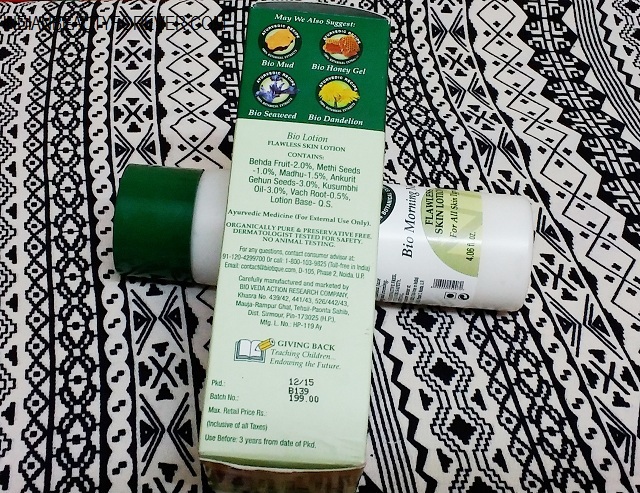 The lotion is a very light weight and has a very herbal and pleasant fragrance. It doesn’t feel artificial or too much. This skin lotion gets spread on the skin nicely and the best thing that I liked was the texture and its formula. This is not greasy at all and people with normal to combination skin can also try it. I am thinking even if I had my oily skin then too this would have fared well, since the texture is very watery, light and easy to get into the skin. Once this penetrates the skin, this leaves a nice refreshing fragrance and even after 3-4 hours my skin won’t feel greasy, shiny or heavy due to this product. This also claims to brighten the skin. I will say that I have liked this as this gives the adequate moisture to my face without making it oilier but I think the brightening thing was more because of the tan removal scrub as I have used this for the past 2 weeks only and I was using the scrub earlier than this. Now having said that the lotion is very light and non greasy I don’t think this will fare the same for the dry skin types too. This is because dry skin needs intense moisturization and this is low on moisture therefore will suit oily to normal skin better than the dry to extremely dry skin. I use this in the morning after the shower and if I am going out then I will use a tinted moisturizer or foundation with SPF therefore, this has done a very good job for me and given what I needed at this point of time depending on the condition of my skin. Not for extremely dry skin or very oily skin. Normal to combination to decently oily skin types can try this. 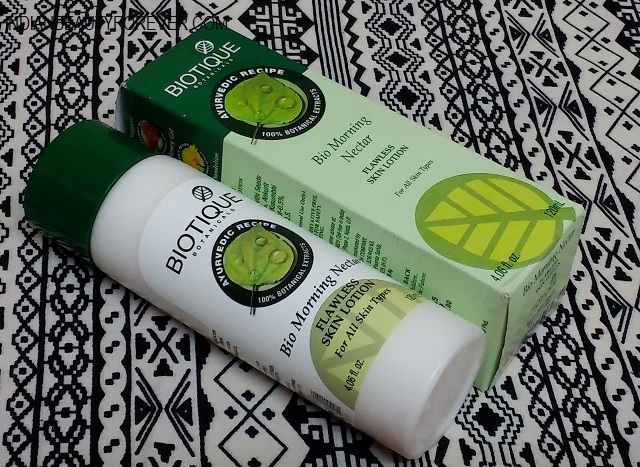 Biotique Bio Morning Necter Flawless Skin Lotion is a good moisturizing lotion for the normal to combination skin. The formula is very light and watery that gets into the skin properly and give a very soft glow but not greasiness at all. Hence this is good for summers as well. I liked this and this has not given me break out as of yet and hopefully will not.